CWA members are getting a jump start on protecting Texas call center jobs in 2019! 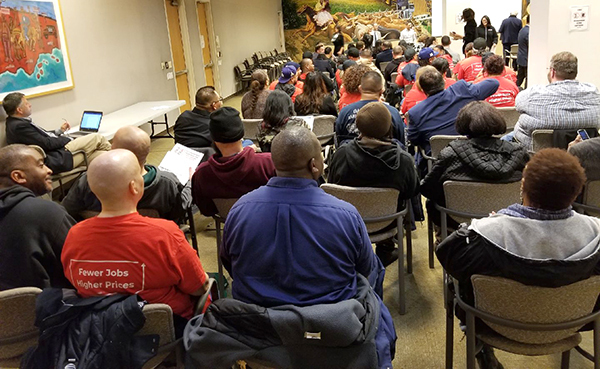 On the opening day of the new Texas legislative session, CWA members from across the state came to the Texas Capitol to build support for a bill to help stop businesses from outsourcing Texas call center jobs. If passed, HB 701, introduced by State Representative Eddie Lucio, III (D-Brownsville), will create a publicly available list of companies that make a practice of offshoring Texas call center jobs, and make those companies ineligible for any state subsidies or financial assistance. The bill also gives Texas consumers the option to be transferred to an in-state telephone customer service representative. The Texas bill is part of a larger CWA legislative campaign to protect U.S. call center jobs by passing similar call center legislation at the federal level and in many different states. On the opening day of the new Texas Legislative Session, CWA members from across the state came to the Texas Capitol to build support for legislation to help stop businesses from outsourcing Texas call center jobs, and to talk to legislators about the need to protect payroll union dues deduction for public employees. 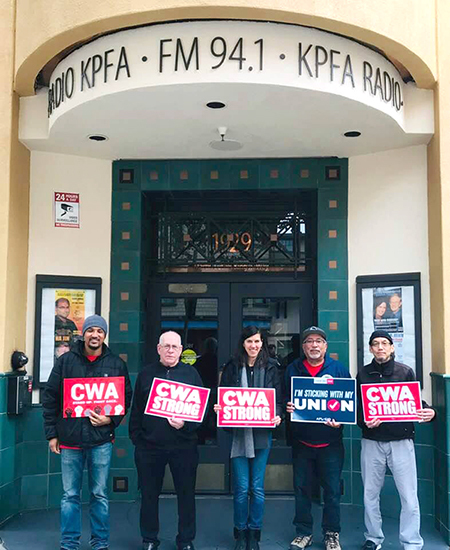 The CWA Local 9415 union bargaining committee is ready to advocate for a fair contract as they head into bargaining with KPFA 94.1 FM in Berkeley, Calif.
New York has had some of the most restrictive, antiquated voting laws in the country. 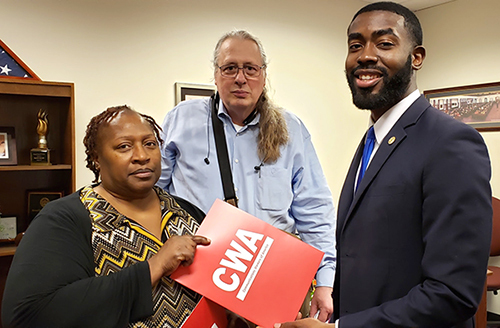 But now, thanks to the hard work of CWA members and retirees during last year's election to bring new leadership in the state legislative chambers, legislators passed a much-needed wave of voting reforms. The new legislation includes early voting, same-day voting registration, pre-registration for 16 and 17 year olds, portable registration, only one primary day, and no-excuse absentee voting. 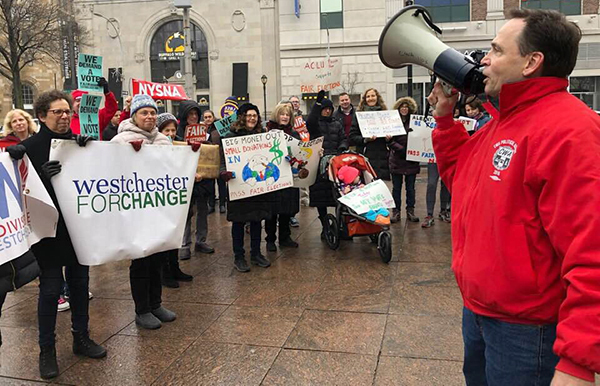 CWAers in District 1 led the way along with other labor unions and activists, calling on Governor Andrew Cuomo to make voting reform a top priority. CWA members in District 9 are showing strong support for the 32,000 teachers across Los Angeles who are on strike in the nation's second-largest school district. 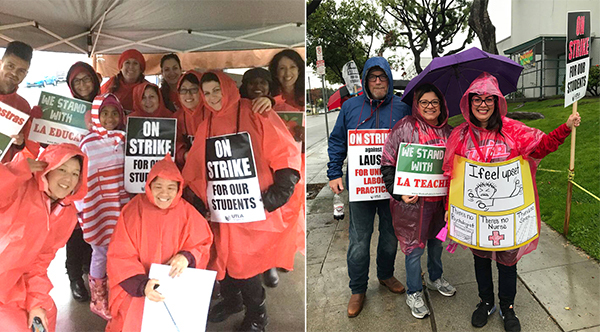 The strike by members of United Teachers Los Angeles (UTLA) comes after almost two years of negotiating on wages, class sizes, and more money for counselors, school nurses, and librarians. Members of CWA Local 9003 were out in force showing support for striking teachers at three Los Angeles schools.